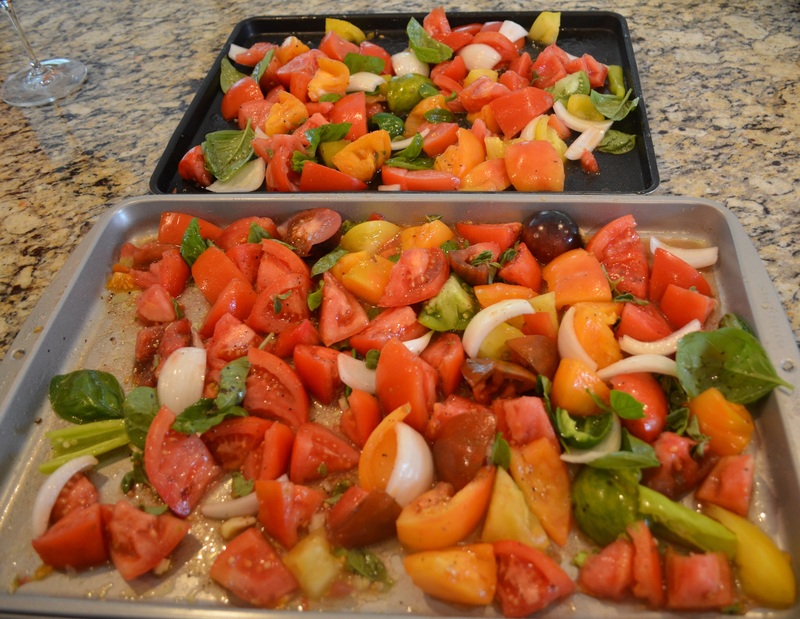 Oven Roasted Tomatoes – Live. Laugh. Love. Lake. Disclaimer: This dish was not created at the lakehouse. I’m afraid that now that summer has drawn to a close, there will be less lake activity to share. However, this is a wonderful end-of-summer recipe that I plan on making again many times, and I’m sure that will include at least a few times at the lakehouse next year. My friend Norma and I had big plans to can tomatoes this summer, but like many big plans, they never materialized. To be honest, while I’ve always liked the idea of having a supply of home-canned tomatoes all winter long, I have never been very interested in the actual process of canning. It just sounds hot, labor-intensive, and messy, and the last thing I would want to do on a beautiful summer weekend. However, during my most recent mammogram I was having a nice friendly chat with the tech, and she told me how she roasted tomatoes and froze them, saying it was so much easier than canning. 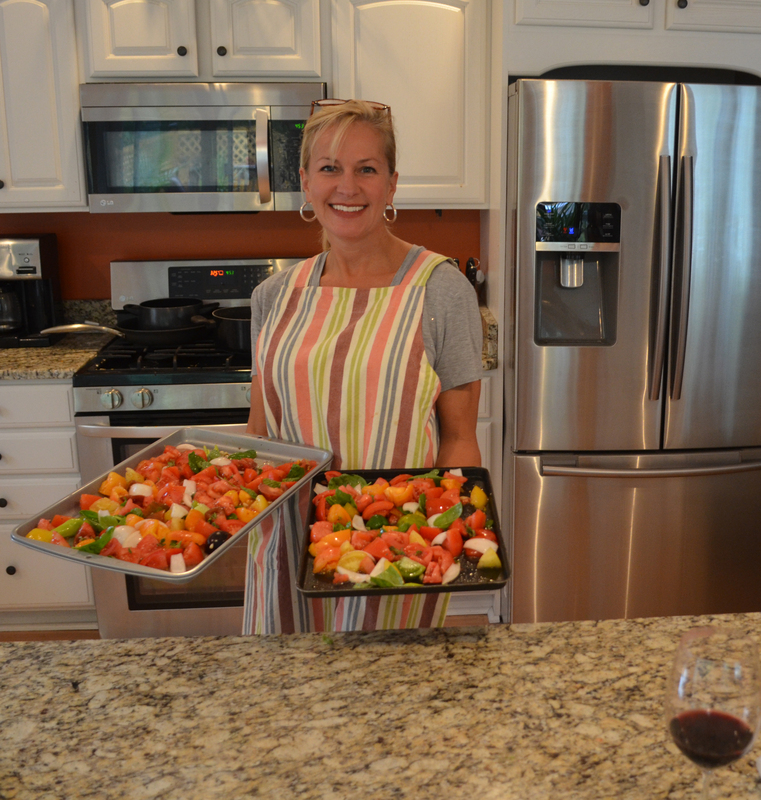 It sounded like a much more do-able way to preserve tomatoes, so Norma and I decided to try that instead. But again, summer got away from us and by the time I went to buy a bushel (or bushels) of tomatoes from the farmers market for a big roasting party, it was too late. All that were available were a few random quart-ish sized containers – not enough to buy in any sort of quantity. But I was determined to at least give roasting a try and make a batch of sauce for pasta, so I bought one container of heirlooms and one of just plain old tomatoes. Yesterday was a rainy, chilly Sunday – perfect for spending some time in the kitchen. Here are the tomatoes, minus one because I had already cut it up. The mammogram lady made a point of telling me the tomatoes needed to be dried carefully, so this is after they were washed and dried. Core and coarsely chop the tomatoes. 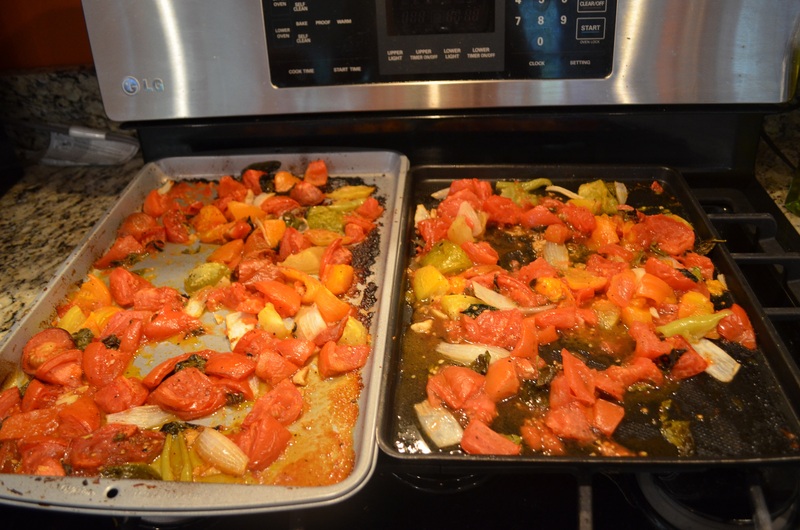 There seemed to be just a few too many tomatoes to spread onto one baking sheet without crowding, so I used two sheets. Next, roughly chop an onion and four cloves of garlic, and sprinkle everything on both trays. Because I had peppers still growing in the garden, I roughly chopped a couple of those and added them to the trays but this is optional. Some fresh herbs are next. I happened to have some fresh basil in the garden, so I clipped a small handful. I like oregano in my pasta sauces, so I bought some fresh and added that as well. The herbs are really up to your taste and what you have on hand; rosemary and thyme would be good too. Remove the leaves of the basil and oregano from the stems (not necessary to chop them at all), and sprinkle them into the mix. Finally, sprinkle both trays with salt and freshly ground black pepper, and drizzle olive oil over everything (a couple of tablespoons per tray). With clean hands, gently toss everything together to make sure it’s all coated with oil and seasoning. I wish I’d removed those pots from the stove before taking this picture. I didn’t try to hide the glass of wine though, because after all, what would a rainy day of tomato roasting be without a little vino? Place both trays in a preheated oven set at 325 degrees. Roast for one to two hours or until vegetables are tender (mine only took an hour). 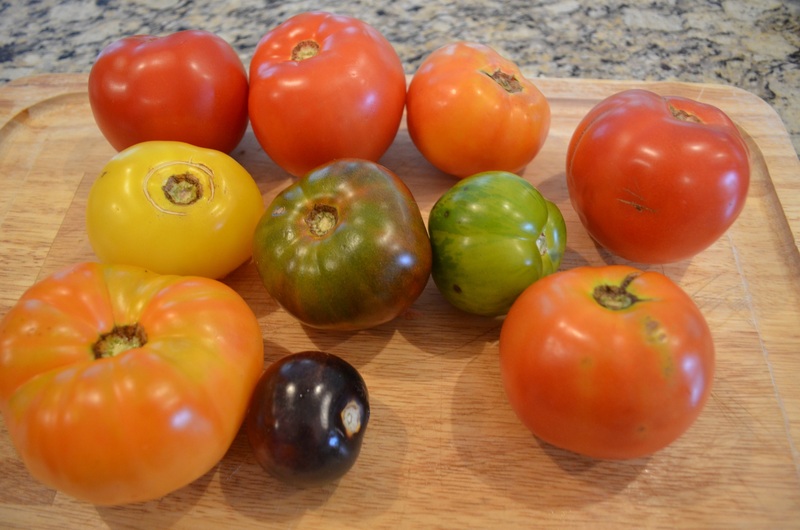 These tomatoes are incredibly flavorful! I ended up dumping one tray into a Ziploc bag and freezing it; the other I used to make pasta sauce. I cooked them down (discarded most of the onion and garlic and just used the tomatoes with their juices) with red wine and a small can of plain tomato sauce, but no extra seasoning was necessary. Preheat oven to 325 degrees. Wash and dry each tomato; core and coarsely chop. Distribute evenly among two baking sheets. Rinse and dry basil and oregano and remove leaves from stems. Sprinkle evenly over both trays; add onion and garlic, distributing equally. Season with salt and pepper and drizzle with olive oil. With clean hands, gently stir vegetables to evenly coat with oil. Add both pans to oven and cook for one to two hours, or until vegetables are tender. Place in freezer Ziploc bags and freeze for up to six months. If using immediately for sauce: Place all vegetables (I removed the onion and garlic; it’s completely up to your taste) in saucepan and add about ½ cup dry red wine. 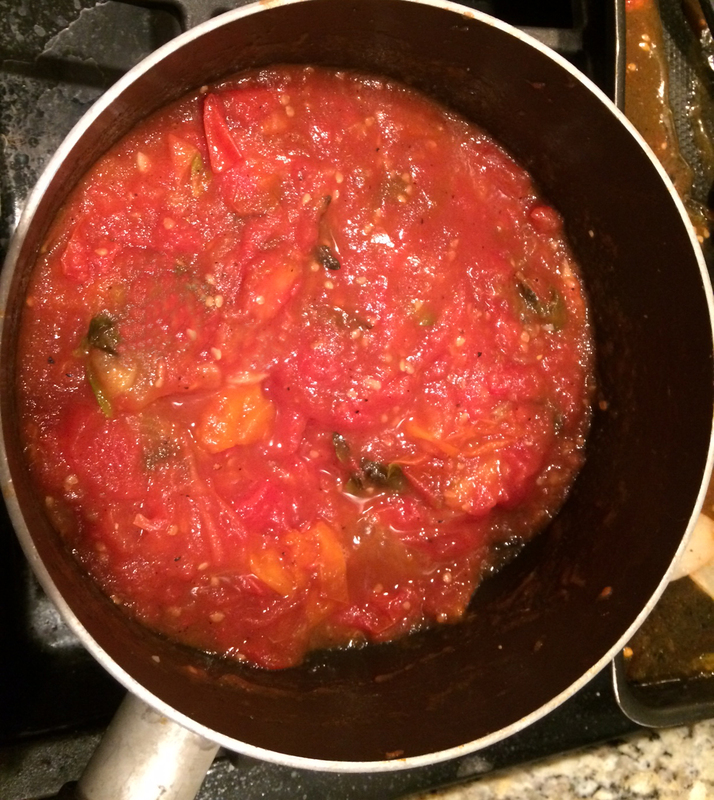 If desired, add small can plain tomato sauce. Cook until vegetables are broken down and incorporated. If you prefer a smoother consistency, use an immersion blender and blend or pulse until you get the right texture. This entry was posted in Uncategorized and tagged lake house, lakehouse, preserving tomatoes, roasted tomato sauce, roasted tomatoes, Spring Lake. Bookmark the permalink.